Click here for 4 full quotes from John Kasich in the book Courage Is Contagious, by John Kasich. John Kasich modeled "Courage is Contagious" on John F. Kennedy's classic Profiles in Courage, but focuses on charitable citizens instead of Kennedy's courageous senators. Kennedy focused on senators who "did the right thing" knowing that it would damage their chances of re-election; Kasich focuses on citizens who "do the right thing" usually against government bureaucrats or other entrenched opponents. 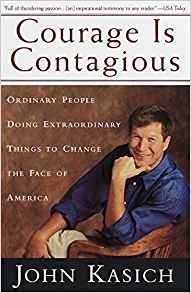 A better title would have been "Charity is Contagious" because Kasich doesn't really focus on "courage" at all. Kasich concludes in the closing paragraph, "The most wonderful thing about the heroes in this book is that they are really just ordinary people who one day decided to act. You can too," Kasich says [p. 265] in the context of urging Congress to support "the new volunteerism." So maybe Kasich's definition of "courage" is something like "unsung hero." The sub-text of all of Kasich's stories is the lack of government as part of the solution, which is a core part of his political philosophy. Kasich makes exceptions for local police departments: more cops are recommended as the solution to help African-American kids in tough neighborhoods like Harlem (p. 97). And Kasich seems to be soft on Medicare � praising that government program for its support of hospice programs (p. 248) � but generally, Kasich's heroes don't want government help at all. The explicit political philosophy in all of Kasich's stories is that religious-based charities offer better solutions than their government equivalents. Faith-based charities and prayer permeate all of Kasich's stories. They're often Catholic (Kasich's religion); and always Christian � with one exception where Kasich includes one Jewish hero. Those free clinics in the chapter beginning on p. 55 are run by a Jewish doctor � perhaps to some that would feel like "tokenism" but to me (I'm Jewish) I appreciated that Kasich understood "Tikkun" as "one of the principles of Judaism to help people [as a] spiritual and moral obligation" (p. 62). All of Kasich's heroes are white too, and the one African-American hero (p. 97, the advocate for more cops and kids) felt like a "token" to me (but I'm white). Overall, Kasich's book and Kasich's solution to America's social ills are suffered by blacks and Jews as the poor unfortunates who need help from the well-meaning white Christians. Many of the recipients of Kasich's well-meaning largesse (and I do think that Kasich is well-meaning) are African-Americans � with some Jewish recipients too, for balance � there's one chapter about a Polish Catholic saving Jews during the Nazi occupation (p. 209). One must conclude that in Kasich's view, white Christian assistance is superior to government-based assistance. Kasich's book provides strong insight into his character and his political preferences. This is not explicitly a policy book, like his 2017 book Two Paths. And it's not an explicitly faith-based book, like his 2010 Congressional memoir Every Other Monday. This book is in between � providing examples of how Kasich would apply his faith-based politics to real-life policy. A must-read if Kasich runs for president in 2020. Cops & Kids Plan: put more police on the street. Educate students that marijuana is a gateway drug. Place babies of addicted mothers into foster homes. Equalize mental health coverage with physical health.